This webpage does not describe a real potential asteroid impact. The information on this page is fictional and provided only to support an emergency response exercise conducted during the International Academy of Astronautics (IAA) 2015 Planetary Defense Conference in Frascati, Italy, April 13-17, 2015. This is only an exercise. This diagram shows the possible positions of the asteroid as red dots (the uncertainty region) at the time the potential Earth impacts begin. 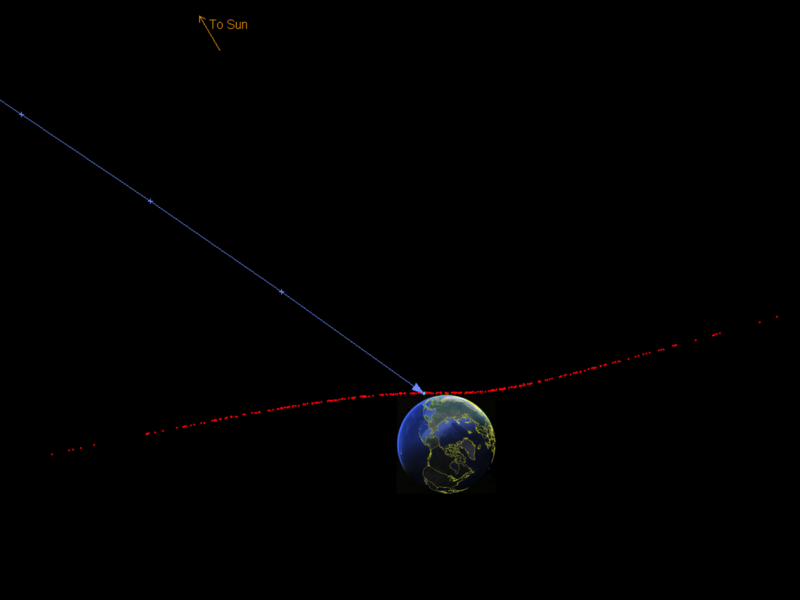 The red dots align roughly along the heliocentric orbit of the asteroid, but relative to the Earth the red region moves in the direction indicated by the blue line. The blue line traces only the central point of the red region. Tick marks on the blue line are shown at one-hour intervals. Since the impact probability is 43%, that fraction of the red region will impact the Earth; the rest of the red points will pass safely by the Earth. 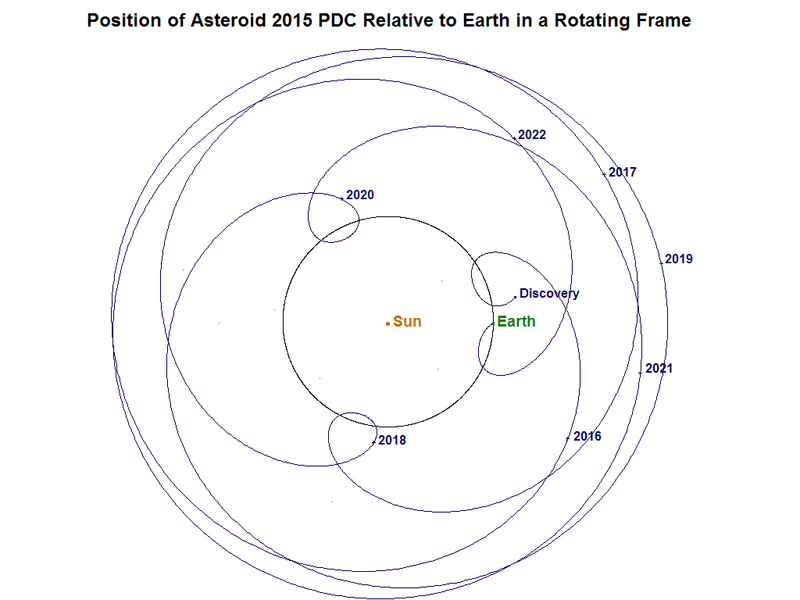 This diagram (not included in the press release) shows the motion of asteroid 2015 PDC relative to the Earth in a rotating reference frame. Both the Earth and the Earth-Sun direction are fixed in this diagram, and the position of the asteroid is plotted as a function of time, from discovery through the potential impact. Tick marks denote the beginning of the noted years. 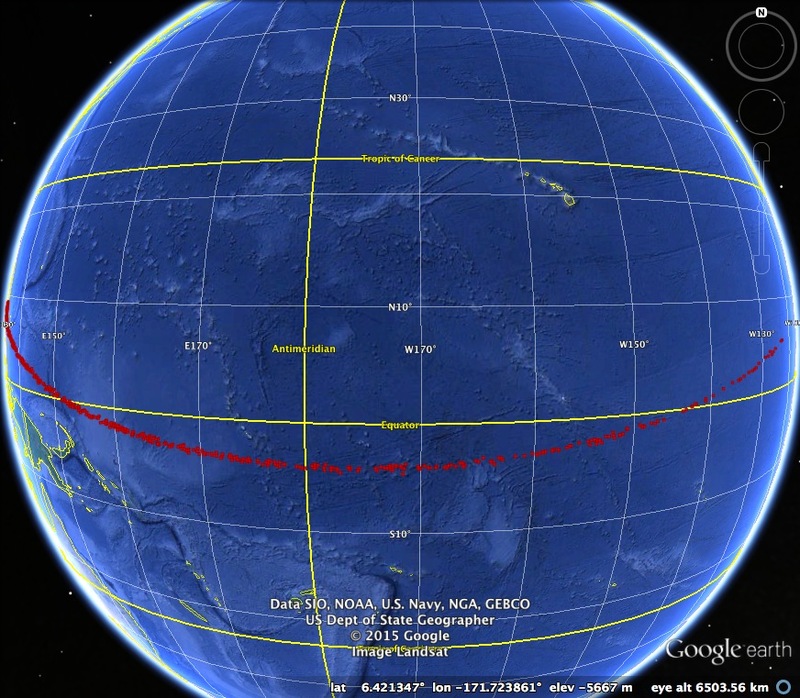 Observations of the asteroid are only possible when it is relatively close to the Earth, but the maximum distance at which the asteroid can be detected varies with angle away from the Earth-Sun line. 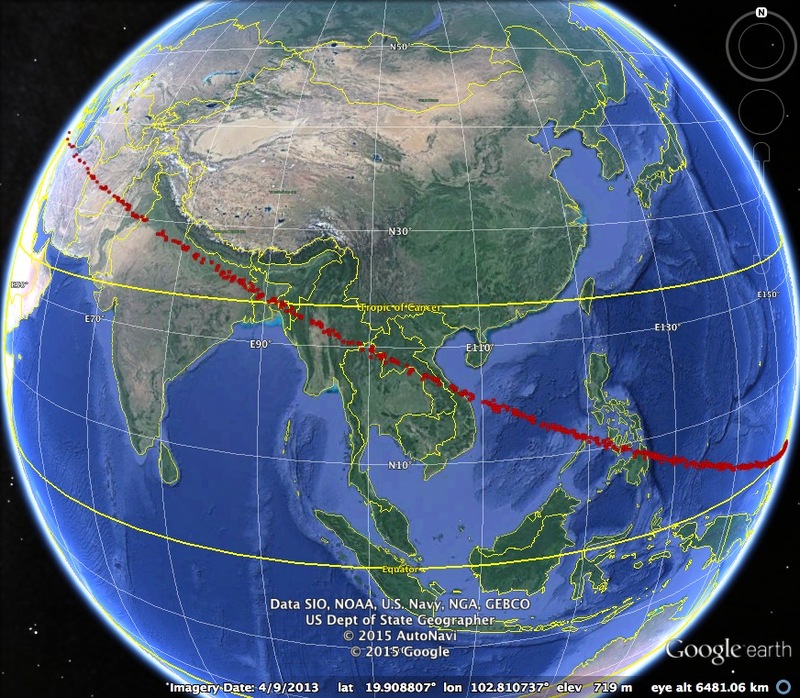 This pair of images shows the updated risk corridor, traced by the red dots. The corridor is somewhat narrower than several months ago, but it still extends from the eastern Pacific Ocean, South Pacific, Philippines, South China Sea, Southeast Asia, Myanmar, Bangladesh, India, Pakistan, Afghanistan, Iran, and Turkey. In the event that the asteroid will impact the Earth, it will impact somewhere within the region traced by the red dots. Asteroid 2015 PDC has been tracked continuously since the last press release in June 2015. It has faded somewhat, but hovered roughly at magnitude 22.5 through most of the second half of 2015. It faded to magnitude 23.5 and 24 in December, requiring 2-meter aperture telescopes for tracking. It faded further, to magnitude 25 in January, and 25.5 in February, requiring 4-meter and larger apertures. Finally, 8-meter aperture telescopes were required in late February and March, when the asteroid was very distant. Because of its orbit, the asteroid spends a lot of time at large distances from the Sun and Earth (much of the time, over 2 AU). As the tracking observations accumulated, the impact probability rose steadily. In mid-June 2015, the probability was about 1%, in mid-July it was 3%, in mid-August, 10%, mid-September, 20%, mid-October, 30%, mid-November, 33%, mid-December, 34%, mid January 2016, 35%. No further observations are possible until late 2016 because the asteroid will be too distant until then. Background information on the scenario. To study this scenario using the JPL HORIZONS system, click here. Description of NASA/JPL NEO Deflection App. Using the Deflection App for this scenario.